Remember those days when Metallica, Iron Maiden, Guns N Roses and AC/DC played on loop in almost every youngsters’ mobile? For almost three decades heavy metal bands ruled the world. However, in the past five years things have changed and Electronic Dance Music (EDM) has overshadowed the rock industry. Though the genre is still alive in some pockets, EDM has clearly taken over the music industry by a storm. In the last two years there have been many different EDM artistes performing in India. 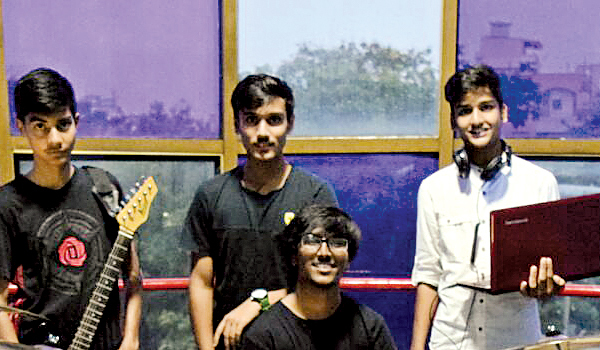 However, against all the odds, with the only intention of bringing back the rock genre, a few young music enthusiasts together have formed The ManiaX. a�?We believe that rock music has always had an impact on the society back then and it is one of the powerful tools of music where we can put across strong message in the forms of songs. We intend to bring back the lost shine of the rock industry,a�? says Shashank Murthy, lead guitarist. Unlike other rock bands where there much of growling music is done by the male vocalists, The Maniax banks on its only female member who is their lead vocalist. Leena, a 16-year-old girl is the person in control. Speaking of their upcoming concert she says, a�?We produce heavy metal and soft rock songs as of now however, we want to take our music ahead one step at a time and have shortlisted amazing tracks for Octa Nights. The crowd can surely expect a few firecrackers on the stagea�? Coining their music to be a�?pleasant, relaxing and soothing,a�� drummer Kamal says he is sure of seeing some wild head banging happening as they take the center stage this weekend. He further disclosed that the band will be releasing their single by the end of this year. The Maniax are heavily influenced by 3 Doors Down, Coldplay and Linkin Park and hence have assured that they will be playing Paradise by Coldplay, Here without you by 3 doors down and Somewhere I belong by Linkin Park. Stepping up for rock genre, Jason Amaral, background guitarist, says that Hyderabad is yet to listen to different genres of music. a�?People are surely experimenting with various genres in Hyderabad. Whereas, cities like Bengaluru and Mumbai have become the hub for different types of music. I am sure we will also be on the list pretty soon,a�? he adds. The ManiaX will be performing along with DJ Raja at the Octa Nights Rock & EDM event at Rendezvous Hyderabad near ISB Road, Financial District on October 1 from 8 pm onwards. Couple tickets at `500.